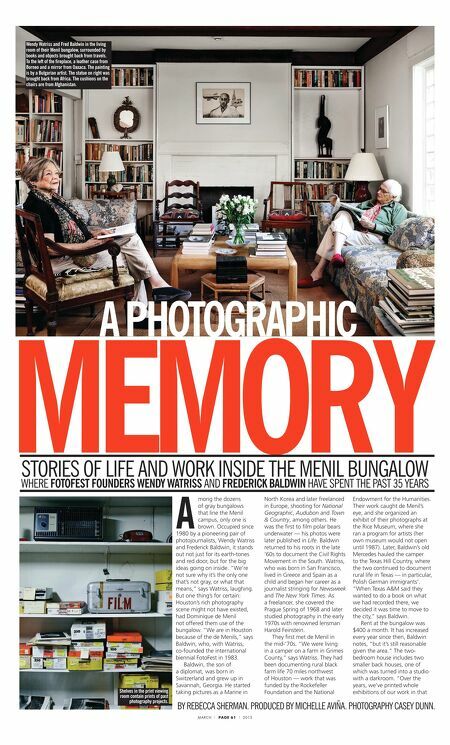 MARCH | PAGE 61 | 2015 STORIES OF LIFE AND WORK INSIDE THE MENIL BUNGALOW WHERE FOTOFEST FOUNDERS WENDY WATRISS AND FREDERICK BALDWIN HAVE SPENT THE PAST 35 YEARS MEMORY Wendy Watriss and Fred Baldwin in the living room of their Menil bungalow, surrounded by books and objects brought back from travels. To the left of the fireplace, a leather case from Borneo and a mirror from Oaxaca. The painting is by a Bulgarian artist. The statue on right was brought back from Africa. The cushions on the chairs are from Afghanistan. A mong the dozens of gray bungalows that line the Menil campus, only one is brown. Occupied since 1980 by a pioneering pair of photojournalists, Wendy Watriss and Frederick Baldwin, it stands out not just for its earth-tones and red door, but for the big ideas going on inside. "We're not sure why it's the only one that's not gray, or what that means," says Watriss, laughing. 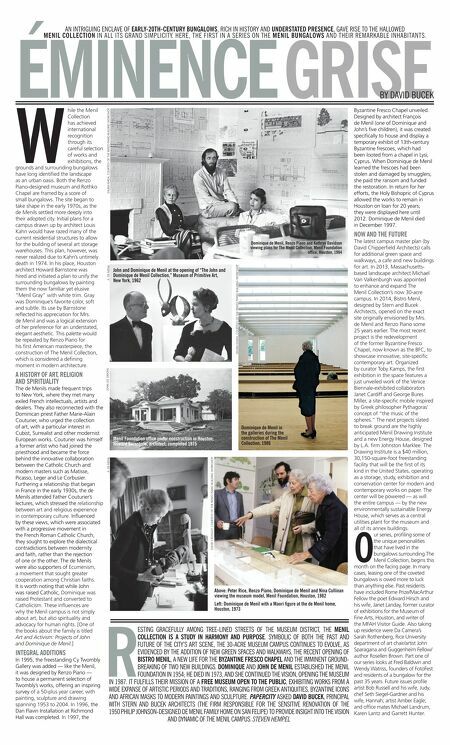 But one thing's for certain: Houston's rich photography scene might not have existed, had Dominique de Menil not offered them use of the bungalow. "We are in Houston because of the de Menils," says Baldwin, who, with Watriss, co-founded the international biennial FotoFest in 1983. Baldwin, the son of a diplomat, was born in Switzerland and grew up in Savannah, Georgia. He started taking pictures as a Marine in North Korea and later freelanced in Europe, shooting for National Geographic, Audubon and Town & Country, among others. He was the first to film polar bears underwater — his photos were later published in Life. Baldwin returned to his roots in the late '60s to document the Civil Rights Movement in the South. Watriss, who was born in San Francisco, lived in Greece and Spain as a child and began her career as a journalist stringing for Newsweek and The New York Times. As a freelancer, she covered the Prague Spring of 1968 and later studied photography in the early 1970s with renowned lensman Harold Feinstein. They first met de Menil in the mid-'70s. "We were living in a camper on a farm in Grimes County," says Watriss. They had been documenting rural black farm life 70 miles northwest of Houston — work that was funded by the Rockefeller Foundation and the National Endowment for the Humanities. Their work caught de Menil's eye, and she organized an exhibit of their photographs at the Rice Museum, where she ran a program for artists (her own museum would not open until 1987). Later, Baldwin's old Mercedes hauled the camper to the Texas Hill Country, where the two continued to document rural life in Texas — in particular, Polish German immigrants'. "When Texas A&M said they wanted to do a book on what we had recorded there, we decided it was time to move to the city," says Baldwin. Rent at the bungalow was $400 a month. It has increased every year since then, Baldwin notes, "but it's still reasonable given the area." The two- bedroom house includes two smaller back houses, one of which was turned into a studio with a darkroom. "Over the years, we've printed whole exhibitions of our work in that A PHOTOGRAPHIC BY REBECCA SHERMAN. PRODUCED BY MICHELLE AVIÑA. PHOTOGRAPHY CASEY DUNN. Shelves in the print viewing room contain prints of past photography projects.